One of the oldies but goodies, both online (since 2007) and on the British high street, you're sure to have heard of Betway at one time or another. With a huge online and TV presence and high profile event and team sponsorships (George Groves’ May 2014 pummeling at the hands of Carl Froch; West Ham), Betway is almost certainly a household name. We found it a bit disappointing that we could only view the promotions after signing in - but what we saw was decent enough. We’d also have liked to have seen some clearer terms and conditions - the welcome bonus which was touted on the main page mysteriously disappeared once we’d logged into the casino itself. This is where Betway really walks the walk and talks the talk! There’s rather a lot of choice on the table - and it looks wonderful. Powered by Microgaming, you can only expect the best of the best - from slots (more on that in a minute) to table games, even video poker- everything will work like a charm, run seamlessly across various devices and will even be pretty generous with the payouts, to boot. Slots: With around 250 to choose from, you can enjoy a range of progressive jackpots (Mega Moolah, Cash Splash, Jackpot Deuces, Treasure Nile), video slots (Thunderstruck II, Avalon II, Immortal Romance), ‘retro’ slots (classic slots) including 108 Heroes Multiplier Fortunes, Mega Money Multiplier and Jewel Thief, and a solid range of branded slots too (Game of Thrones, Bridesmaids, Lara Croft Tomb Raider). Roulette: There are about 10 variants on offer here, ranging from the usual and expected (French Roulette, European Roulette) to the more exciting (Multi-Wheel Roulette Gold Series, Multiplayer Roulette Diamond Edition). Blackjack: Oh boy, this is certainly the place for blackjack fans! With 23 variants, you'll have to work your way through and find what you like best: all of the usual types of blackjack are here (European Blackjack, Multi-Hand Blackjack), but so is our favourite variant - Super Fun 21 (which really is ‘Super Fun’) and also some pretty exciting other variants to try: Bonus Blackjack Multi Hand, Vegas Strip, Perfect Pairs European Blackjack Gold Series and Hi-Lo 13 European Blackjack, among many, many others. Table games: Choose from 18 table games, including baccarat, Pai Gow Poker, Sic Bo, Triple Pocket Hold’Em Poker, craps, Red Dog and more. Video poker: Yes, there’s even a separate section for video poker, because there are 21 games to choose from! Try Double Bonus Poker, Tens or Better Poker, Deuces Wild Poker and a fair few other variants. ‘Other’ games: These are the games which don't fit neatly into either category and include scratch cards: Keno, Flip Card, Germinator, Three Wheeler and Enchanted Woods. Betway also has a celebrated sportsbook and an in-play section, which is directly accessible from the casino site, as well as a sister bingo and poker site. Interestingly, there‘s also eSports and Vegas sections for willing punters. As mentioned above, Microgaming, the industry-leading software developer, is exclusively responsible for powering the games at Betway. Microgaming games are reliable, stream beautifully on iOS, Android and Windows devices - smartphones and tablets! - and have a wonderful back catalogue to boot. The site itself is nicely presented and very, very user-friendly. The range of games is divided into sections at the top of the screen and filtered according to their type; there’s also a handy search bar, which (strangely) not all online casinos include. There’s a lot to like here at Betway, but we’d say the best part of the whole experience has to be the efficient and helpful customer support - which we'll get into shortly. Ah, Betway’s VIP programme, which is refreshingly called the ‘Betway Plus Loyalty Club’. Every new player starts off on the lowest level of Blue, and must earn Tier Tokens - you do this by wagering and depositing at Betway. For every £10 you deposit, you’ll earn 5 Tier Tokens...but remember, that not all wagers contribute equally, with different games contributing different percentages. You’ll have a time period in which to earn more points and ascend to the next level - for a new player, this time period is 10 days, which you can see by clicking the ‘Current Tier’ option in the toolbar when you're logged into your Betway account. This also shows you how many points you currently have, and your current tier level. You’ll also see two circles - one telling you how many points you need to maintain your current level, and one telling you how many Tier points you need in order to get to the next level. 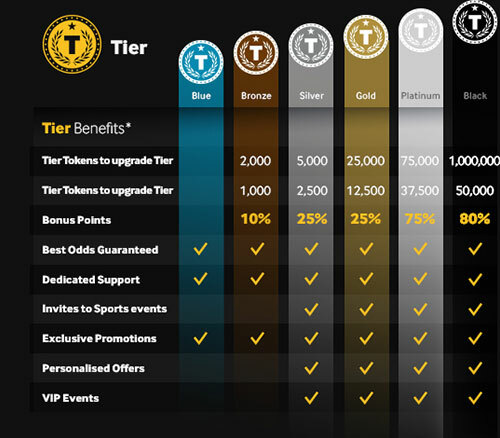 Here’s where the benefits get a little confusing: with your Tier Tokens, you can also receive Plus Points, which you receive according to your current tier, and which are generated by playing and wagering on games. Once you reach 5000 Plus Points, you can redeem them for cash prizes and other benefits. And, if you're earning them anyway, you might as well use them...or lose them. You can see when you might lose them by going to your ‘Current Tier’ tab on your toolbar and seeing how much time you have left. *Current as of June 2018; check Betway’s website for any updates. Current as of June 2018; check Betway’s website for any updates. Betway’s FAQ is pretty good - that is, if you can find it! Clicking on the ‘Contact Us’ link at the bottom of the page will take you the FAQ. Otherwise, Betway offers a 24/7 Live Chat, which was answered for us within 20 seconds, a UK landline and an email address for support too. Otherwise, the casino has active accounts on Facebook, Twitter and Google Plus. Betway is licensed by the Malta Gaming Authority and the UK Gambling Commission. In terms of quality and games available, Betway is definitely the place to play. However, the almost hiddenness of Betway’s promotions page was a bit strange, as was the slightly confusing nature of the Plus Points/Tier Points. Overall, with Microgaming-powered games and the sheer range of games on offer, this is a solid online casino choice for every type of player.